Tonight during dinner, my friend mentioned to me that he recently deployed a project using Portlet technology. It reminded me that when I devloped a portal site back in 2002, there was no such standard. I wanted to give Portlet a try since the draft was finalized, but yeah, I was lazy :P. Tonight I finally downloaded Jetspeed 2. 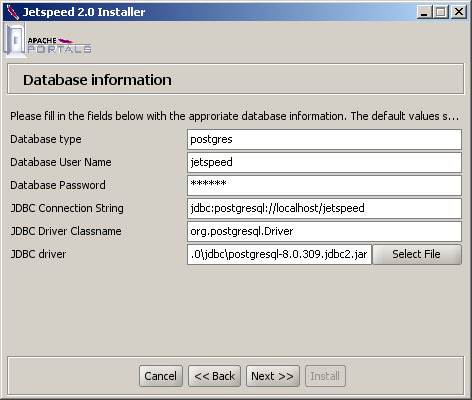 Jetspeed 2 can work with many DBMSs, including my favourite: Postgresql. But after downloading the MultiDb version installer, I found that it won't install as the appropriate SQL scripts were not created. Instead of trying to build it from source (yes, I am very lazy recently and... what the hack, I was just trying to install it on a Windows machine... so I don't want to compile from source :P), I found that similar issue has been reported and you can download the script directly. Just start the Jetspeed installer, and it will unpack itself to an "antinstall" directory under your temp directory (e.g. C:Documents and SettingsadministratorLocal SettingsTemp). Then, before you proceed with the installer, unpack the Postgresql script package into the database directory under antinstall. Then proceed as usual.